Christian author aims to help readers strengthen their faith and enrich their inner life. Above All by Gary R. Ferris Jr.
Inspirational, evocative, and heartfelt, Above All will strengthen readers’ faith, evoke their imagination, and awaken their thoughts. Gary R. Ferris Jr. has published many books that send a strong message to Christian readers. 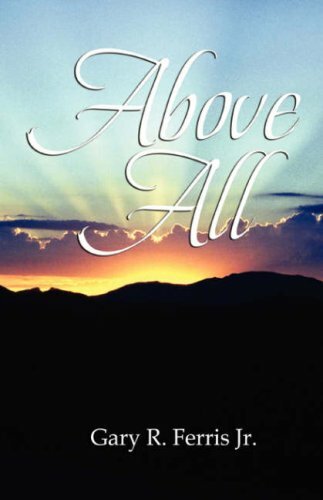 Above All is one of his poetry collections that truly captures many emotions of the spirit, an enriching read for those who want to overcome difficulties by building a closer relationship with God. In this compilation of poetry, Ferris communicates spiritual emotions that everybody can relate to, including the depth of love, the strength of faith, and the power of prayer. The inspirational messages found in the poems will get them through trying times, reminding them that amid trials and tribulations, God walks with them and guides them to the light. The poems are meant to nourish the heart and touch the soul. By reading them, readers will be able to embark on a spiritual journey to discover spiritual emotions that otherwise lay dormant within. Inspirational, evocative, and heartfelt, Above All will strengthen readers’ faith, evoke their imagination, and awaken their thoughts. It is a helpful guide for Christians who feel lost or are losing hope in the face of adversities. Written by Gary R. Ferris Jr.
Gary R. Ferris Jr. was born on November 21, 1965, in Oklahoma City, Oklahoma. When he was eighteen, he enlisted for the Marine Corps in California. After completing his service, Ferris took on the world of cable TV, where he built his career. He began writing poetry in 1990. His work has been included in several books, such as Inscriptions of Time and The Enchantment of Memory. For more information, please visit the author’s website at www.garyferrisjr.com.